Austrian Government Will Try To Seize The House Where Hitler Was Born : The Two-Way The state rents the property now, and has tried for years to purchase it from the current owner. Officials say their aim is to prevent the property from falling into the hands of neo-Nazis. An exterior view of Adolf Hitler's birth house in Braunau am Inn, Austria. 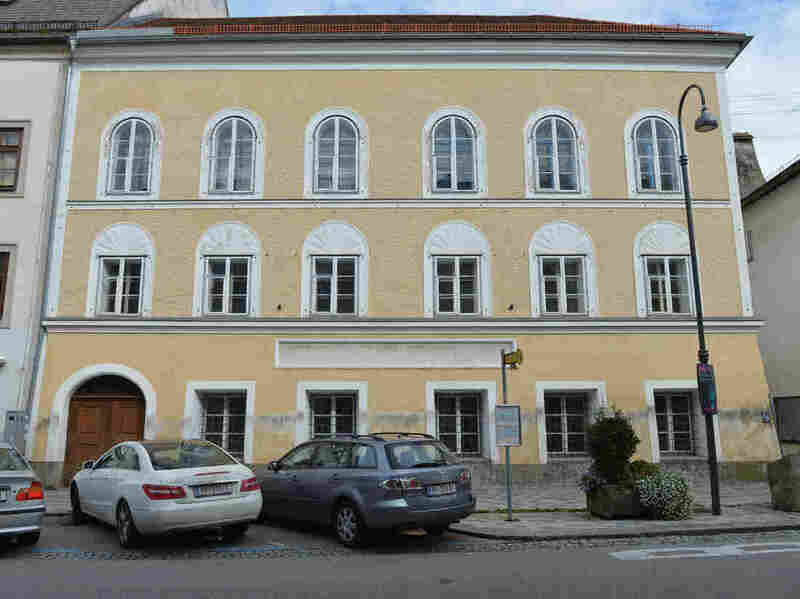 Austrian officials say the government will attempt to seize the house where Adolf Hitler was born. The Austrian government, which rents it now, has tried for years to purchase the property from its current owner. "The aim is to prevent the property from falling into the hands of neo-Nazis," Kerry Skyring in Vienna tells NPR's Newscast unit. "Now, the interior ministry says the only way to ensure it does not fall into the wrong hands is to requisition it." Skyring says that in front of the house, a memorial stone carries these inscriptions: "For Peace, Freedom and Democracy," and "Never Again Fascism." Hitler's name does not appear on the plaque. Interior ministry spokesman Karl-Heinz Grundboeck tells Agence France-Presse that the government is "currently examining the creation of a law, which would force a change of ownership and pass the property to the Republic of Austria." He adds the state will offer to compensate the current owner. Local resident Gerlinde Pommer's family has owned the home since 1889, the wire service says. The Austrian government has rented the property since the 1970s, using it as a center for people with special needs. However, according to AFP, "the arrangement came to an abrupt end five years ago when Pommer unexpectedly refused to grant permission for much-needed renovation works." Florian Kotanko, a local historian, told the BBC in 2014 that Pommer "does not allow any changing of the house, so you can't rebuild any rooms, you can't build modern bathrooms or put in a lift. It is difficult." The Austrian government has paid Pommer some $5,600 every month in rent, the New York Times reported last year. Newsweek says Pommer is "thought to be in her mid-60s" and "reclusive." The magazine adds that her reasons for blocking renovations to the property are "unclear." Braunau am Inn, a town near Austria's border with Germany, is grappling with how to handle its weighty legacy as Hitler's birthplace. "Various proposals have been put forward about how to use the house, including turning it into flats, a centre for adult education, a museum or a centre designed to confront the Nazi past," the BBC reports. "There have also been calls for its demolition, with one Russian MP offering to buy the house and blow it up." There's no word yet on what the Austrian government plans to do with the property if it successfully seizes it.